Monuments: the Santo Domingo church, El Muro gardens, Museo Arqueológico (Archaeological Museum), Bil-Bil and Colomares castles, Las Águilas garden, the Estupa Budista (Buddhist Stupa), watchtowers (Torrebermeja, Torrequebrada, and Torremuelle), Plaza de España, historic quarter of Benalmádena – Pueblo, and the Roman ruins at Benalmádena – Costa. Avda. Antonio Machado, 10 (29630). Benalmádena is located in the region of the Costa del Sol, 20 km from Málaga and at a height of 280 metres above sea level. The average temperature is close to 18 degrees. The town consists of three urban areas connected to each other but differentiated: Benalmádena pueblo, Benalmádena Costa and Arroyo de la Miel. Benalmádena is a town of picturesque contrasts: tradition and modernity, sea and mountains, outstanding beauty, kind people, great food. Despite being a village, it offers all the services anyone could need. Great beaches, amusement parks, white-washed walls, modern marinas, shops, restaurants, history and the greatest and most international atmosphere imaginable: that's Benalmádena. The municipality is very well communicated with the rest of the Costa del Sol by the Mediterráneo Expressway (AP-7; N-340), and by a commuter train that goes to Fuengirola, Torremolinos and Málaga city. Monuments: Castillo Sohail castle, the archaeological sites of Suel and Finca de Acevedo and Finca del Secretario, Museo de Historia de la Ciudad. Geographical Location: in the Western Costa del Sol region, on the municipal boundaries of Mijas and Benalmádena. 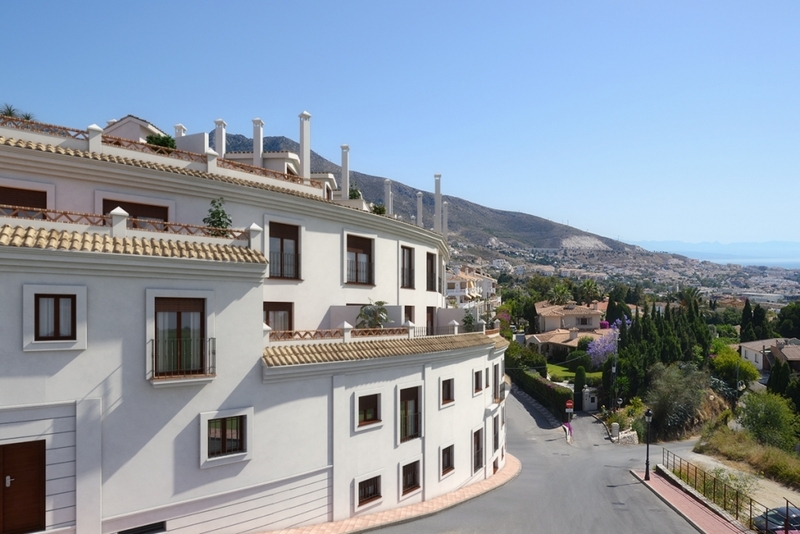 The city is 27 kilometres from the provincial capital and 8 from Mijas. The average annual rainfall is 570 millimetres and the average annual temperature is 18º C.
Paseo Jesús Santos Rein, 6 (FUENGIROLA 29640, SPAIN). Fuengirola is an open, dynamic, international city. It provides all the services of a modern town, besides an interesting range of leisure opportunities and endless golden sandy beaches. The highly cosmopolitan nature of the town has caused its cuisine to conform to this reality, so it is not easy to speak of native cuisine except, of course, for fish caught off its coast, which are generally served fried. “Pescado a la sal” or “pescado al horno” (fish baked in salt) is also considered a traditional dish, as is of course rice with seafood. The Mediterranean Expressway (A-7; N-340) perfectly links the town of Fuengirola with the rest of the Costa del Sol. It is also possible to get here by train (Route C-2 of the “Cercanías” or commuter line) from Málaga, Torremolinos and Arroyo de la Miel (Benalmádena) or from the airport. Monuments: the Roman villa of Río Verde, Paleo-Christian basilica of Vega del Mar, Roman hot springs or bathhouses of Guadalmina, La Encarnación Church, the Arabic Fortress, San Juan de Dios Hospital, Bazán Hospital (Museum of Engraving), Casa del Corregidor (House of the Magistrate), Santo Cristo de la Vera Cruz hermitage, Ayuntamiento (City Hall), hermitage of Santiago, Cortijo Miraflores Museum and the Bonsai Museum. Geographical Location: in the centre of the western Costa del Sol, between the slopes of the Sierra Blanca range and the coast. The city is 56 kilometres from Málaga. The municipality records an average annual rainfall of 630 litres per square metre and the average temperature is 18º C.
People who visit Marbella during the hot summer months are always surprised by the microclimate that maintains the town in an average temperature of 18.7 ºC. Its beauty, the kindness of its people, its shops (luxury and traditional), the mountains that surround it and its wonderful beaches are just some of the things that Marbella has to offer as a vacation destination, but, even to live there all year round. Marbella is a very Spanish town, albeit one with a tangible and complementary international edge. As in any other coastal municipality in Málaga “pescaíto frito” (small fried fish) is the most requested traditional dish in Marbella, along with paella, gazpacho and ajoblanco, which also hold their own at the top of the most traditional menus. Marbella’s culinary offer goes far beyond that, Several of the most famous restaurants on the Costa del Sol are located in Marbella, where international haute cuisine combining the traditional and the innovative has gained full acceptance. No one could fail to list Marbella’s leisure ports among the resources that have contributed to the city’s pre-eminent ranking in the world of tourism. These are not just port facilities with services peculiar to that type of installation but rather genuine social and leisure centres with an intensive level of commercial activity. One must agree that it is not often that a single municipality has three port facilities as is the case with Marbella. It is home to the Marbella Leisure Port, the Cabopino Leisure Port and Puerto Banús, which is without a doubt the most famous of all due not only to the large and luxurious yachts that customarily dock there but also for the quantity (and quality) of leisure establishments, businesses and restaurants to be found in its environs, to the extent that a stay in Marbella without a visit to Puerto Banús seems unthinkable. Geographical Location: in the western Costa del Sol region. The locality is some 430 metres above sea level and is 30 kilometres from the provincial capital and 8 from neighbouring Fuengirola. The municipality records an average rainfall of 660 litres per square metre and the average temperature is 17º C.
Plaza Virgen de la Peña, 2 (29650). 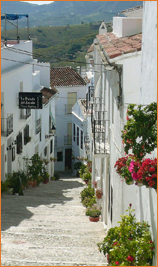 One of Mijas' peculiarities is that it has three centres of population: Mijas Pueblo, Las Lagunas and la Cala de Mijas. The first of these is a classic whitewashed Andalusian village of Moorish origin, while most of the municipal services and part of the building developments are in Las Lagunas. Cala de Mijas is a very well known residential area for locals and foreigners alike. Despite the international presence, the village has preserved its culinary tradition, whose most notable characteristic dishes are salmorejo (a thick cold soup) and soups of widely different kinds, such as maimones (made with bread and olive oil), cachorreñas (made with tart oranges), ajo (garlic) and gazpachuelo (a cold soup). Buñuelos (fritters) and hornazos (a pastry containing a hard-boiled egg) make up this municipality’s native confectionery contribution. The Hipódromo de la Costa del Sol (Costa del Sol’s Hippodrome) is one of Mijas’ most interesting contributions to the world of sports and leisure. It was inaugurated a few years ago and is already considered to be among the best in Spain. As well as being the site of horse races, the establishment has several restaurants and hosts live musical performances. The races are held on Sunday mornings during the winter season and on Saturday nights during the summer. You must take the Mediterranean Expressway (AP-7; N-340) from the Costa del Sol. If you leave Málaga going towards Cádiz once you are past Benalmádena you must take the A-368 (the signs are very clear) to Mijas. If you leave from Fuengirola in the direction of Málaga you must likewise take the Mediterranean Expressway and the A-387 to Mijas. Monuments: the Nuestra Señora de los Remedios church, Torre del Reloj (Clock Tower), El Calvario hermitage, the Castle walls, Palacio del Marqués de Mondéjar (palace of the Marquise of Mondéjar), Casa de la Borrega (La Borrega house), lookout towers, Museo Etnográfico (Ethnographic Museum), Museo Taurino (Bullfighting Museum), Museo de Paleontología (Museum of Palaeontology), Museo Arqueológico (Archaeological Museum). Geographical Location: in the western part of the Western Costa del Sol. The northern area of the municipality adjoins the Ronda region, while the village itself is located on the coastal fringe. The average rainfall is 900 litres per square metre and the average annual temperature is 17º C.
Avda San Lorenzo, 1 (29680). Estepona is a traditional Spanish town that has all kinds of services and a fantastic leisure offer. Beaches, shopping, a public hospital, museums, a soccer stadium, marinas and even a bullring! Michelle Obama chose the area located between San Pedro Alcántara and the centre of Estepona for her Spanish vacation. This area is called "The New Golden Mile" because of the concentration of luxury shops and great residencies along the coast. The native culinary offer has of necessity been broadened by the huge tourist influx in the area, to the extent that international cuisine has established itself in practically all restaurants. Nevertheless, Estepona’s maritime tradition has not only survived but, precisely because of tourism, has grown, and the delicious “pescaíto frito” (small fried fish) is one of the identifying features of Estepona kitchens. Since it is located right on the Western Costa del Sol Estepona can be reached with perfect ease by the AP-7 expressway or the coastal highway N-340: Just follow the road signs. Monuments: the historic district of Nerja and Maro, Balcón de Europa, the El Salvador church, Las Angustias hermitage, Nuestra Señora de las Maravillas church (Maro), El Águila aqueduct, Cueva de Nerja (Nerja Cave), Chanquete’s boat, Paraje Natural de los Acantilados de Maro-Cerro Gordo (Cliffs of Maro-Cerro Gordo Natural area). Geographical Location: in the most easterly part of the region of La Axarquía, and by extension of the province of Málaga, in the foothills of the Sierra de Almijara. The locality lies 30 meters above sea level and is 45 kilometres from Málaga. It records an average rainfall of 460 millimetres and the annual average temperature is about 20º C.
c/ Carmen, 1 Bajos Ayuntamiento. (29780). The eastern edge of the province of Málaga is connected to the province of Granada by the municipality of Nerja, which is not only the most important tourist centre of the Eastern Costa del Sol, but also the one that boasts the most attractive coastal landscape of the entire Málaga seashore, since here the slopes of the Sierra de Almijara jut boldly into the sea, something unusual in this area of the Mediterranean, forming a very rugged coastline. Inland, the territory of Nerja ascends the Sierra de Almijara mountain range –which forms a geographic unit with the Sierra de Tejeda-through a country of deep ravines, sheer cliffs and peaks that is furrowed by numerous watercourses, forming an extraordinarily diverse mountain landscape. In the areas closest to town, there are a large number of housing developments that coexist with terraced plots where all kinds of subtropical fruits and vegetables are raised. Nerja's most typical local dishes are pimentón con pescado y almejas (paprika with fish and clams), cazuela de fideos con pescado (noodle casserole with fish), ajoblanco con uvas (a chilled soup with grapes), ajocolorao (made with potatoes, peppers, onions and garlic), besugo de Burriana (a Nerja beach) a la plancha (grilled Burriana sea bream), berzas (cabbage), calabazas fritas con sardinas (fried squash with sardines), choto en salsa de almendra (suckling kid in almond sauce) and, naturally, pescaíto frito (small fried fish), customary anywhere on the Costa del Sol.